Please note: This is a review for the second book in the Lotus War series, and so contains spoilers for the first in the series, Stormdancer. You may wish to read my review for that book instead! 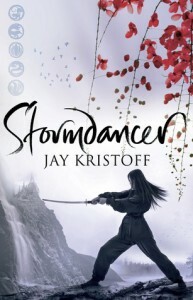 Stormdancer was one of my favourite books of 2012. 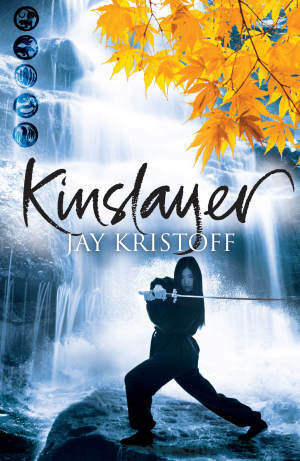 I’m happy to report that Kinslayer not only lived up to the first epic story but completely surpassed it in awesome. Excuse me while I have a bit of a gushy moment! I’ll try to describe what I love about this book without actually talking about what happens – you need to read that for yourself. It’s been a few months since Yukiko and Buruu killed Shogun Yoritomo, losing her father and kick-starting a massive rebellion in the process. The Stormdancer and her arashitora have been travelling around to various cities, stirring up unrest and generating sympathy for the Kagé rebels. Since the fateful killing, Yukiko has struggled with crippling headaches brought on by the sudden flood of power through the Kenning, her ability to sense and communicate with life around her. At the Kagé base in the Iishi mountains, the erstwhile Guildsman Kin is struggling to fit in with the other rebels – they don’t trust him at all and the feeling is mutual. How can their common interest in bringing the Shima Empire and Guild down progress if they cannot work together? What did others think of Kinslayer?